For a gamer, being able to hear your enemies coming and communicate with your allies clearly is critically important to getting the most out of your games. For that reason it is crucial that all serious gamers have a headset that they can count on when the fighting heats up. 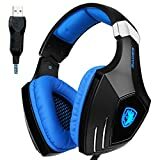 The market for gaming headsets can be overwhelming at times, with tens of different brands, hundreds of different models, and prices that range from ten dollars all the way into the hundreds, it can be a daunting task to find a headset that meets your needs without breaking your budget. To help you on your quest for an affordable headset we reviewed five headsets under $30 that walked the fine line between quality, features, and cost. We spent hours talking with gamers about what they valued in a headset and then scoured the Internet to find the top five gaming headsets under $30. After close inspection we then picked, from our top five, our favorite: the Sades SA902. The SA902 strikes a perfect chord between features, quality, and budget. The Sades was rocketed to the top by a trifecta of excellent ear piece comfort, crisp audio quality, and virtual 7.1 channel surround sound support, making it our clear winner. Talking to avid gamers, it became clear that the main goal of a headset is to let you comfortably communicate online while also being able to accurately hear your in-game surroundings. After analyzing the feedback our gamers gave us, these traits boiled down to a few key features that ensure you will have a great time playing both on and off line. Armed with this list of features, we hunted down the top five headsets that excelled in these categories, for under $30. Gamers spend tons of time plugged in and playing their favorite titles. When you and your teammates are putting in long hours and pushing hard to defeat the next boss it is important that you are comfortable and that your headset isn’t causing fatigue or pain. There is nothing worse than having to stop an awesome session with your friends because your headset is pinching your ears too much. That’s why we have listed comfort as our number one priority for selecting a headset. Incredible audio, superb microphone quality, none of it matters if the device hurts too much to use. There are several key factors to consider when it comes to comfort. First, ear pieces must fit well on or over the ears. It is important that the ear pieces do not applying pressure to, or bend, the cartilage in your ears. Second, having a well padded and adjust headband is key to a pain-free fit that will keep you online for hours. Other elements of comfort include the quality of the foam padding and its covering. Superior pads are made of memory foam with a breathable cover that prevents your ears from getting too warm and sweaty during long sessions. While many manufactures can get carried away adding heavy features to a headset, one of the most often over looked factors in headset comfort is the overall weight. Heavier headsets just accentuate any pains caused by insufficient padding or a poor fit. When it comes to gaming headsets, lighter is always better. Our survey of gamers indicated that the next most important feature of video game headsets, after comfort, was the quality of the sound. This trait is determined by the sound frequency range and the audio decoding scheme. Sounds frequency range indicates the range of noises that the speakers in the headset are capable of producing. As modern games increasingly feature rich and vibrant audio, being able to hear the fine details can dramatically improve the gaming experience. One of the other key elements in speaker sound quality is the size and type of the speakers driver. This is the part of the speaker responsible for converting electrical signals to audio waves. The materials used in speaker driver can have a large effect on the quality of sound. Most speaker drivers in gaming headset are 40mm or 50mm. Larger drivers will be able to produce more sound, however, they will also weight more. Another aspect in the quality of your audio experience is the audio decoding. 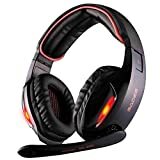 The minimum for a gaming headset is directional stereo sound, however, many modern headsets will include surround sound support up to 7.1 channels. When selecting a headset, surround sound is one of the most important aspects of audio quality. It is the feature that helps you determine which way noises, like the footsteps of your enemies, are coming from. In budget headsets true multi-channel surround sound isn’t available, however, manufacturer’s have created virtual surround sound systems to mimic these effects, which are popular in more expensive headsets. Any online gamer you ask will have experienced it before, a teammate that’s blasting everyone with each and every breathe and all of the background noises from their room. When selecting a headset it is important that your microphone supports noise canceling features to ensure that you don’t broadcast every word your mother is yelling at you from across the room. Headsets can also come with directional microphones. This feature can help remove environmental noise pollution from filtering through to your teams. Being able to hear all the details of the audio while gaming is critical to having an immersive gaming experience. To ensure that you don’t miss a beat many headsets come equipped with noise canceling technologies that attempt to block out noises from the world around you. Noise canceling can be passive or active. Passive noise canceling technology typically consists of sound dampening ear pieces that block outside noise by securely fitting foam around your ears. Active noise canceling headsets, in additional to having sound dampening ear pieces, generate audio waves to cancel out the ambient noise from the room. Different gamers will have different preferences as to how much, or little, of the outside world they want to hear. For those that covet immersion active noise canceling is a valuable feature. However, if you are also concerned by being able to hear the ring of a phone or doorbell, simple passive noise canceling will walk the middle ground between immersion and accessibility. At the end of the day, if you are going to enjoy your new gaming headset it is important that it can connect with your device. While wireless connections are popular amongst high-end headsets, in the economy market you are left with two choices: USB or 3.5mm audio jack. Classic 3.5mm audio jacks are extremely durable and versatile. They can not only be plugged into your computer but also your iPhone, stereo, laptop, etc. However, they are less responsive than modern USB connections and carry a much lower throughput of data. USB cables have the distinct advantage of being able to transmit power as well as data to the headset. This power connection is especially useful as it allows headsets to power technologies such as active noise canceling without the need for batteries to be placed in the ear pieces. This benefit is very convenient and helps cut down on weight, which also increases headset comfort. After extensive review our number one pick was the Sades SA902. This well rounded headset earned the first spot with a strong combination of a well padded, adjustable, and comfortable headset with a directional and adjustable microphone. The headset has wide, over-the-ear, ear pieces that gives your ears plenty of space while still providing reasonably good passive noise canceling. Power is transmitted to this headset through a 3m USB cable that supports generic Windows Plug and Play technology. For us, though, the feature that pulled the SA902 to the top of our list was the sound quality and the inclusion of virtual 7.1 channel surround sound. As the only headset on our list with surround sound, this feature really made the Sades stand above the rest. For the price, you really can’t beat the 902s sound quality and comfort! Another quality offer from Sades, the AW80 ranks second as it delivers comfortable ear and head pads paired with active noise canceling speakers and a 50mm sound driver that delivers pulsing, deep, audio for an immersive experience. Additionally, this Sades provides an adequate multi-directional microphone that can be adjusted to fit the user. 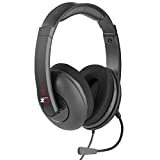 The headset, while still heavy, manages to cut down on weight and still provide active noise canceling by utilizing a 2.2 meter USB connection that works right out of the box with PC Plug and Play support. The Sades AW80 only misses out on the top spot due to a lack of surround sound support, supplying only stereo sound to your ears. Sades adds to the novelty of this product by providing a bass vibration feature that will leave your ears buzzing on the deep bass notes. The Bengoo pulls into third place by offering a reasonably comfortable and relatively light-weight headset that can be worn for hours without fatigue. The adjustable and directional microphone provides good voice quality while the speakers 50mm magnetic neodymium drivers deliver excellent volume and depth. Equipped with a 3.5mm audio jack, this headset is compatible with a wide variety of devices. It should be noted that while the audio data is transmitted via the 3.5mm audio jack, a separate USB cable powers LED lights on the headset. Unfortunately, the G9000 offers neither 7.1 surround sound or active noise canceling, both of which would have made a great addition to this headset. Turtle Beach is a power house of high end gaming headsets, however, their budget option leaves something to be desired. While the Z11s 40mm neodymium magnet drivers deliver excellent sound quality, it lacks both surround sound and active noise canceling. The microphone of the Ear Force Z11 features a fully adjustable boom; unfortunately, it also lacks a noise canceling features, leading to slightly more noise pollution than we would like. The Turtle Beach headset provides passive noise canceling through mesh ear cups that are both breathable and light weight. This, paired with the stripped back design and a simple yet comfortable headband, ranks the Z11 as one of the lightest and most comfortable headsets we have reviewed. Like the Bengoo, the Turtle Beach headset utilizes a 3.5mm audio jack for connectivity. Making the bottom of our list is the Rosewill Gamer 2100. While a good headset for the price, the Rosewill fails to stand out on any accord, providing solid stereo sound with a light-weight construction and a comfortable fit. The highlight of the Gamer 2100 is the microphone which is equipped with a noise-canceling function that does a great job of blocking ambient noise. The 3.5mm audio jack delivers the flexibility to connect with a variety of devices, however, its 1.8m cable is shorter than we would have liked. Ergonomically designed, the headset ear pieces are stripped down to be comfortable and light and it makes a great option for gamers that want to remain in touch with the world around them. 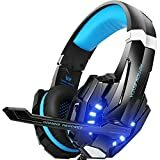 The budget market for gaming headsets is full of many great options that will easily fulfil your basic gaming needs without breaking your bank. We found our favorite, the Sades SA902, to be the best combination of features and quality. However, the most important thing is that you get a headset that is comfortable to wear so, if at all possible, head to a local shop to try out headsets before buying. Comfort is king, so don’t feel bad about returning a headset that just isn’t the right fit for your head.